Advances in Medical Physics (AMP) is designed to help medical physicists and technically inclined physicians stay current in medical radiation science and technology, especially in sub-fields of medical physics other than their own. AMP 2014 contains an expanded focus on radiation oncology topics, including the new GammaPod 60Co device for breast radiosurgery, the allure of targeted dose enhancement via gold nanoparticles, strategies and devices for respiratory motion management, proton therapy fundamentals, and novel high resolution 3D dosimeters for the verification of complex treatment plans. 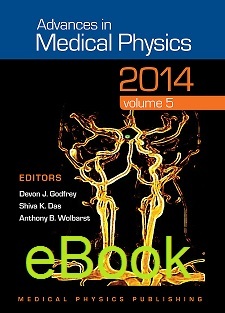 Additional chapters highlight the role of the ICRP and IAEA in medicine; a review of currently available passive dosimeters; novel x-ray photonics and phase contrast imaging technologies; state-of-the-art PET and cardiac SPECT implementations; the fundamentals of parallel MRI, and advanced MRI sequences; and the first part of a suggested road map for teaching MRI to medical physics and engineering students.